Planetary Radio Q and A: Why isn't New Horizons stopping at Pluto? This week's Planetary Radio features Bruce Betts on"The Meaning of LIFE" -- Phobos LIFE, that is. It's a cool project that the Society is contributing to the Russian Phobos-Grunt mission; it'll carry microbes to Mars orbit and back, and is designed to study the long-term effects of exposure to the space environment on DNA and other important proteins. On "Questions and Answers" I answered the question:"After going to all the trouble of sending New Horizons to Pluto why just pass by and not go into orbit?" I researched my answer on the New Horizons mission FAQ page. Nearly a decade will have elapsed between New Horizons' launch and its close approach to Pluto on July 14, 2015. 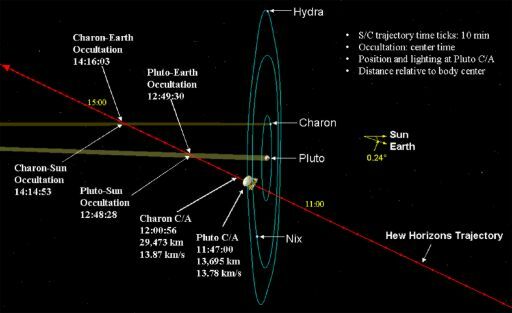 The flyby will happen so quickly that only part of the currently sunlit hemisphere of Pluto will be mapped at high resolution. This seems like a lost opportunity, but there's no other way. New Horizons took a nearly 1-second exposure to capture this image of a faint Pluto and Charon among a dense field of stars in the constellation Serpens. 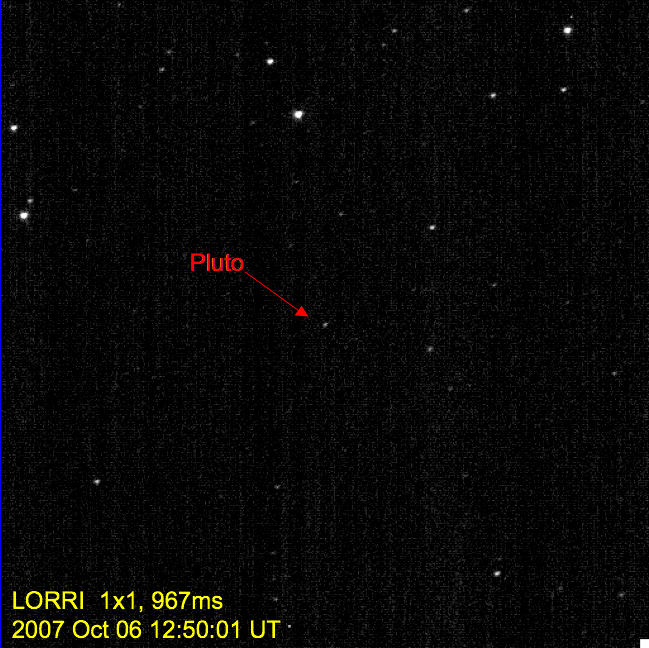 When the image was taken on October 6, 2007, New Horizons was still 3.6 billion kilometers from Pluto and Charon, too far to resolve any features on their surfaces (or even to resolve the two bodies as separate objects). New Horizons, like all spacecraft, began its journey with the same orbit around the Sun as its home planet, Earth. The rocket that launched it changed the speed and direction of its orbit to send it out to the distant reaches of the solar system. In order to achieve Pluto orbit, the speed and direction would have to be changed again to match Pluto's. But New Horizons' trajectory has it passing Pluto nearly perpendicular to its orbit at a relative speed of almost 14 kilometers per second. For comparison, the launch rocket accelerated New Horizons from 0 to 16 kilometers per second relative to Earth in the first place. Other spacecraft have achieved orbit at nearer planets because they started out with trajectories that more closely matched their goals, and the bigger planets have much more mass than Pluto does, so the planets' gravity was used to brake spacecraft into orbit. The New Horizons team has another excellent reason for not going into orbit. Flying past Pluto means that New Horizons will travel onward to encounter two or hopefully more other, smaller members of the Kuiper belt, helping to place Pluto in context and advance our understanding of the dimmest reaches of the solar system. 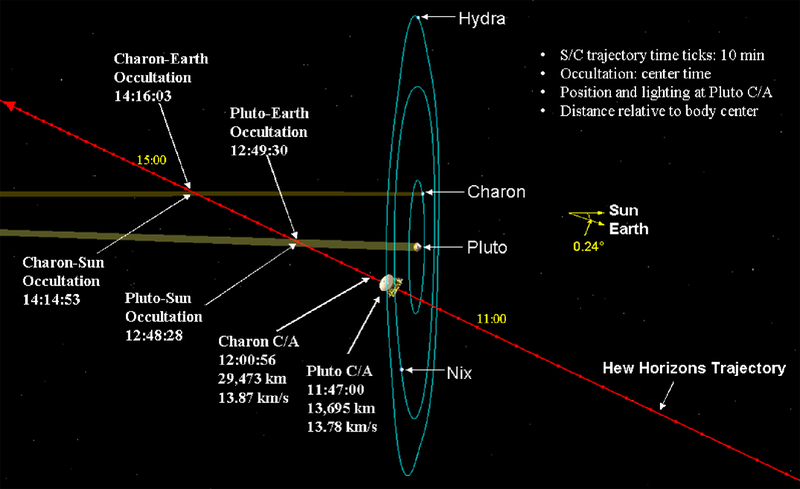 Closest approach to Pluto -- culmination of an epic 3462 day journey across the planetary system: 14 July 2015. I still think its too bad it can't orbit Pluto after 9 years and all that money. But I guess we will never know the real reason why.